Since prehistoric times, spices were originally used as food seasonings, but slowly is known to have a variety of benefits. Particularly spices have antimicrobial capability so as to preserve food. This method is expected to begin in the tropical regions where food can not be preserved because of climatic factors. In contrast to temperate regions have winter so that the food can be preserved in low temperature. The meat in general in various cultures spiced more than vegetables because meat is more easily damaged. Various archaeological evidence found that humans use medicinal plants at least since the Paleolithic era, about 60 thousand years ago. However expected it to happen earlier, because primates are still alive today have used a variety of specific leaves to cure certain diseases. Collected plant samples from the site of prehistoric Neanderthal cave Shandiar in Iran discovered a large amount of pollen from eight species of plants, with seven of them are still in use today as an herbal treatment. In written history, at least the studies on the herb leaves have been conducted since 5000 years ago in Sumeria, and written on clay tablets that lists hundreds of medicinal plants. In the year 1500 BC the ancient Egyptians wrote Eber Papyrus which contains more than 800 medicinal plants, including garlic and marijuana. In India, Ayurvedic medicine has used a variety of medicinal plants since 1900 BC. Emperor of China Shennong is said to have written at least 365 medicinal plants and their use, including marijuana and ephedra (which became the origin of the word name of the drug ephedrine). In Ancient Greece, at least the herbs have been studied since the 3rd century BC by Diocles of Carystus, but most contents similar to those found in Egypt. Various herb leaves have positive effects when tested in vitro, in animals, and small-scale clinical trials, but not as rare as some herbs have a negative effect. 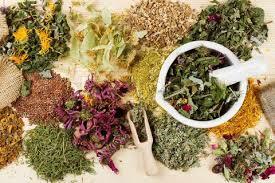 In 2002, the National Institutes of Health began to fund clinical trials of the effectiveness of herbal medicines. Survey in 2010 to 1000 species of plants, 356 of which already have the results of clinical trials on pharmacological benefits. About 12 percent said "no significant benefit" although already available on the market. And according to Cancer Research UK, none of the herbal treatment clinically proven to prevent or treat cancer. A variety of herbal medicine experts criticized the study scientific towards herbal medicines because they do not incorporate the historical knowledge that can provide information about the optimal dose, species detail, harvesting time, and the target population of potential recipients.